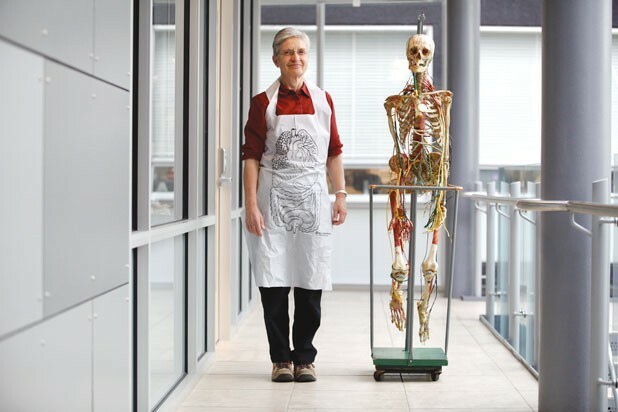 Jean Szilva has a seemingly gruesome job: teaching gross anatomy. But she loves it. The 61-year-old former family practitioner commutes on foot from Winooski to the University of Vermont, where, with three fellow instructors and a group of cadavers, she shows medical and physical-therapy students the nuts and bolts of the human body. She’s won many teaching awards for her innovative approach; among her hallmark techniques are videos, costumes and even dancing. Seven Days met with Szilva in her office to pick her brain. SEVEN DAYS: Can you tell me a little about how you went from family practice to what you’re doing now? JEAN SZILVA: I guess [family practice] just got to be too much. You were starting to get much more paperwork, the explosion of different providers, [and] you felt like you were coping more with people’s access to health care than giving health care. I just got disenchanted with the practice of medicine. So I goofed around and did some other weird things. I did a little carpentry; I did a little financial advising. Champlain College was advertising for a biology instructor [and I taught there]. I [also] taught some for Community College of Vermont, which was extremely rewarding. At least half of my students were women who had started families very early and now wanted a good job, and so they’re going back to school and they had a lot of fears. It was a wonderful population to work with, because they really had many, many more talents and skills than they gave themselves credit for. [Later] I started teaching this undergraduate course at [UVM] in anatomy and physiology for nurses, dental hygienists and all other kinds of allied health people. The anatomy lab involved one cadaver for 200 students, and we made this work. I would videotape my presentation. It would involve a handheld camera and me standing on the cadaver table. The students could go in there, throw the video in and watch me go through it. It was wonderful stuff. The other thing I’d do with the undergrads was I’d have “Anatomy Week in Review.” On Friday afternoons I would get in a large classroom, and for two hours they could pepper me with questions. It was outrageously fun. SD: Do you still use those unorthodox teaching techniques? JS: Yes. For more than 10 years now, I’ve been teaching medical students and physical-therapy students gross anatomy and neural science. Medical students sit an ungodly amount of time in lecture; their brains just get filled to exploding. So about every 15 minutes I try to do something ridiculous, like dress up as a pirate [laughs]. Or we’ll break into dance. For the physical-therapy students, I’ve dressed up as a brain stem. Humor makes people remember better. SD: How does anatomy lab work, exactly? JS: We either assist [students] with the dissection or we’ll go around and say, “OK, now that you’ve found it, talk to me about it. What’s it do? Why does it do that? What’s gonna happen if it busts?” And it’s way fun, because you don’t know what you’re gonna find at each table. You have some people, you walk up to that table and they’re dissecting better than I could. And some people, it looks like they dissected with an egg beater. Some people aren’t meant to be surgeons. And that’s OK.
SD: What do you love most about your job? JS: I love most when somebody doesn’t understand, and all of a sudden they go, “Oh!” I live for that sound. I get such a dopamine rush [laughs]. SD: What do you say to the folks who argue that cadavers should be phased out in favor of online video dissections? JS: Well, that would be cheaper, and that’s why schools are going that way. [With videos alone] you can learn the names of things and you can kind of picture where they are. But if you want your health care provider to have eyes on the ends of their fingers, they better have been there. SD: How do you help students navigate the emotional experience? JS: In our experience, there’ll be a group of [students] who are feeling really excited: Let me at it. We want [them] to remember that this is somebody’s daddy, grandmother, sister. And then there’ll be some who go, “I don’t know if I can do this,” and we say, “Yes, you can. This is what this person wanted you to do.” You’re only supposed to do this if you really, truly believe that there’s something more to be gained, and we’re doing it in a very respectful manner. It’s the only way that I can do it. We are so profoundly grateful to the people who donate their [bodies], and to their families, because if the families object, it’s not happening. When I donate, it’s gonna be a chance to teach one more class, because the cadavers really are the teachers.